As the summer orchard season draws down, there are still a few peaches available for picking. Perfectly ripe off the tree is the way to go, but we always pick too many. 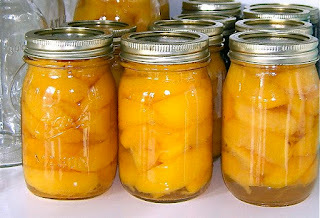 After Laura’s recipes for peach cobbler, peach pie, peach crumble, peach turnovers, peach salsa, peach sangria, peach ice cream and peach jam have been exhausted, there are usually a few peaches left over. This time of the year many newspapers and magazines feature articles on canning fruit. Some are too basic (boring) some are too creative (terrible), but here is one we found in Poland that’s easy to prepare, tastes great, and has our own optional spin to kick it up a notch. Fill a large pot with enough water to cover a portion of the peaches. Reserve the rest. 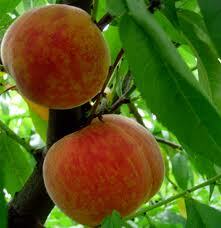 Drop the whole peaches in boiling water and boil for 3 to 5 minutes. Remove the first batch, drop in the next batch and so on - until all the peaches have been boiled for 3 to 5 minutes each. While the 2nd batch of peaches is boiling, remove the skins from the first batch. They should come off very easily while still hot. Do the same for the rest of the peaches. In the mean time, put on the quart of water and sugar to boil. When boiling, stir until all the sugar is thoroughly dissolved and remove from the burner. Gently cut each peach in half and remove the pit. Don’t worry that some of the pits don’t come out easily or the peach halves end up like chopped up quarters – it will all look just fine in the syrup. Wash the jars, lids and rubber seals very well. Pack the peaches firmly into each jar, but without pushing them down. Leave about an inch from the top. 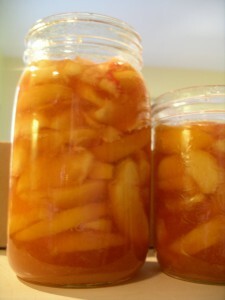 Pour in the syrup to just cover the fruit and tap the jars to remove any air from the peaches. Close the lids loosely. Now we must pasteurize - do not skip this step. Put the jars in a large pot and cover with lukewarm water. Slowly bring to a boil within 20 minutes or so, and, simmer for at least 20 minutes. Remove the jars from the water, re-tighten the lids and cool. Store the jars in a dark, cool place and enjoy whenever you wish. The flavors are much brighter than canned peaches from the grocery store. Two options: To change up the flavors, you can add some red berries. To give your peaches a kick, to the syrup you could add an ounce or two of peach or orange-flavored brandy such as Grand Marnier. Smacznego!